The Ruby Lake Wildlife Refuge is about 60 miles south of where we were camping in the mountains. The drive there had great views of the mountain range. There are supposed to be wild horses out here. I'm not sure if these unshod horses were them, or if they were merely open-range horses. They didn't seem to be too wild, nor in a hurry to move off the road. We ended up driving slowly around them. Our road climbs into the mountains and over Harrison Pass to the other side. Near the summit, this Swainson's Hawk was soaring. This is the other end of the Ruby Crest Trail. Where you can hike "into the wild." The road turns to gravel near the pass, and remains so into the Wildlife Refuge, which can be seen below. There are interesting rock formations up here. A large area of wetlands that attract a variety of birds for nesting and during migrations. 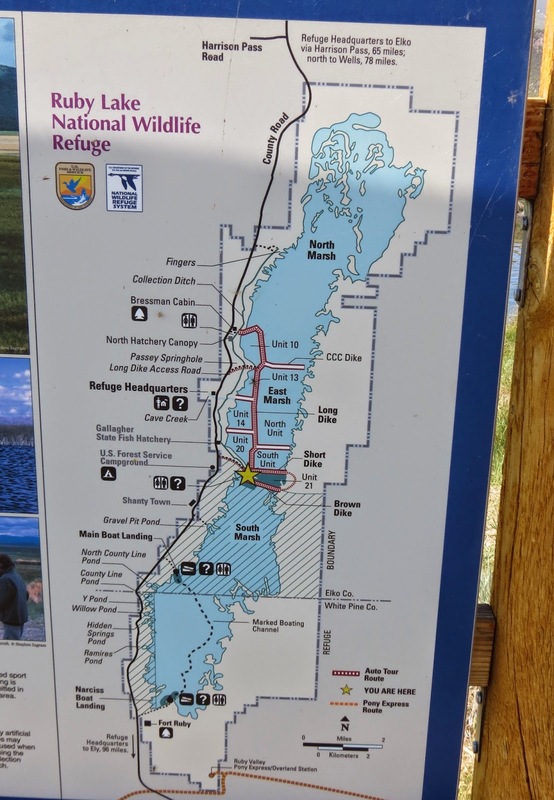 Map of the Refuge. We took the Auto Tour. There are lots of birds out there....what did we see? Oh, that's not a bird...it's a beaver. And even prettier Yellow-headed Blackbirds. Birdie said she heard a Sora...do you see it? Me neither. They hide in the reeds and are very hard for me to spot, so I took a picture of the Scaup that I could see. And then...there was the Sora...with a baby!!! What a great find! Sora feeding her fuzzy black chick. Mama kept taking the chick back into the reeds to hide, but he was hungry and followed her right back out. That was fun! Swans nesting in a beautiful setting. Reminds me of scenery in Alaska. Pair of nesting swans. We saw other swans later, farther away. They were in their mating plumage...with the long feathers down their backs. Sparrow with food to take back to the nest. Swans viewed from the other side of the nest. White-faced Ibis. His white face only shows up during mating season. It's mating season. I spent a lot of time trying to get a good picture of the black and white Dragonflies. This is the best I could do since they wouldn't hold still. View from the canal where they were. Cranes among Avocets and ducks. A Ruddy Duck (blue bill signifies mating) with two black and white dragonflies flying over. Not a good picture of an Eared Grebe. Tern on left, and Eared Grebes on right. Canvasback duck with five ducklings. Ruby Lake National Wildlife Refuge...well worth a day trip when in the area. Or, there is a campground, and would be well worth several days stay. Kayaking is allowed at certain times of the year too. We have now moved westward, inching toward Oregon, but first a stop to shop, do laundry, fill fresh water and dump holding tanks. Definitely got a lot of wildlife viewing in here. Love your pictures.